Isn't the Galaxy Pinto already a cross between Tiger Shrimp and a Taiwan Bee? Crossing it back with a TB doesn't make sense. I have the opportunity to get some culls from a friend which are low/middle-grade galaxies. I would love to get them but I only have a TB tank and sadly not enough money to get another tank, so I was wanting to get to breed them and if I would get some TB-Galaxy mix I would know what to suspect. I am confused (normal) about what is a Taiwan bee? 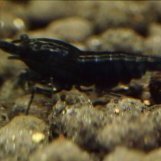 I thought that is was a mutation of the black(red) bee shrimp as implied by the chart in the first post in this thread Tibee, Taitibee, Pinto, Mischling, F1, F2 terms explained. However this forum category is called "Taiwan Bee Shrimp - Caridina mariae x logemanni" implying that it is a cross between bee and tiger. Googling didn't really help so can someone pleas explain or direct me?